Getting the absolute best out of the new 2nd Generation Ryzen CPUs requires the use of an also-new chipset, the X470. By and large the same as existing X370, better overclocking support, slightly lower power consumption, and a couple of minor feature updates make it the logical choice if you are planning a high-performance Ryzen build. You needn't spend a fortune on X470; motherboard are available from £115, but if you want to go the fully-loaded route, the major manufacturers all have high-end models in their arsenal. Almost doubling that entry £115 price is the MSI X470 Gaming M7 AC Wifi. So let's examine just what else you get over a basic MSI board. 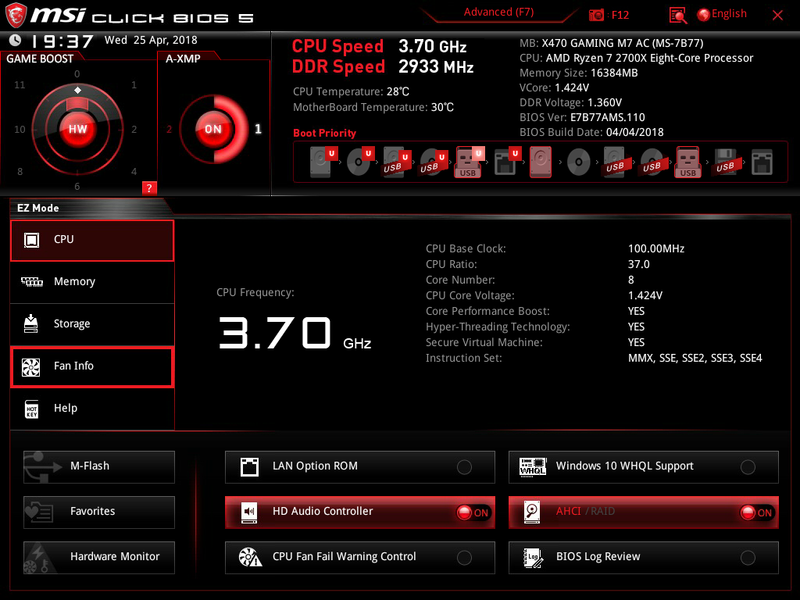 MSI goes in heavy on the overclocking front, evidenced by the dual 8-pin EPS on the right-hand side. The board works just fine with one, but if you're overclocking to the limit and have a compatible PSU, there's no harm in adding a second, and OC potential ought to be helped on by the beefy, 14-phase supply. There are two heastinks around here, yet the larger covering above is simply a plastic shroud that hides the various I/O ports. The cooling component certainly isn't as impressive as the Aorus Gaming 7's, which connects its heavy-duty apparatus via a thick heatpipe. We don't like the location of the main CPU fan connector, sandwiched between the memory slots and processor socket - anyone with a top-mounted radiator will find it hard to get to. 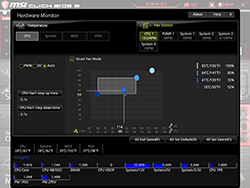 MSI offers troubleshooting support in two ways, through the usual debug LED and a four-LED arrangement by the 24-pin connector. This seems overkill. Better is the provision of a further five fan headers in sensible locations, plus specific port for Corsair lighting. The board has two-zone RGB support. One source is on that large I/O cover, the other via eight LEDs mounted underneath the 24-pin connector. If that's not enough, per the competition, the Gaming M7 includes headers for two 5050 RGB strips and another for individually addressable LEDs run off a 5V source. 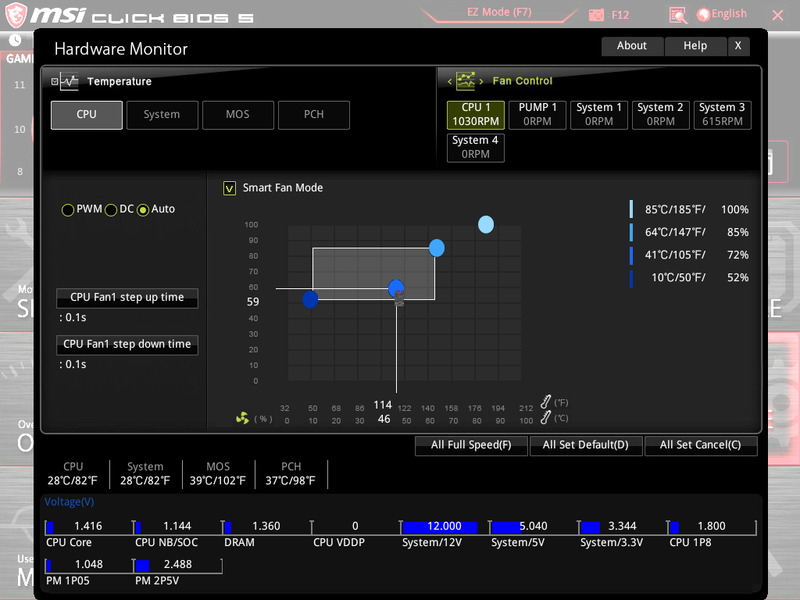 Unlike Aorus, who also goes for RGB on the DIMM and PCIe slots as well the audio section, MSI's is more restrained. MSI does go about the chipset heatsink in a different way, mind. Rather than have individual heatsinks for both M.2 slots, the Gaming M7 uses an all-in-one 'pincer' heatsink sat on top of the chipset. Replacing one M.2 drive requires the entire heatsink to unhinge. As usual, you receive ancillary airflow if the primary graphics card is an open-air design, but like other boards, using an Nvidia Founders Edition, equipped with an enclosed radial fan, actually stifles M.2 cooling potential. That said, the heatsink does work well. Running a 15-minute 4K write test on the super-fast WD Black NVMe drive resulted in a 66°C temperature without a heatsink, 60°C on the Aorus, dropping down to 55°C here: good stuff, but we believe the results would be even better if the WD didn't have a paper sticker on top of the Nand and controller. It's worth noting that only the top M.2 slot runs at full speed; the bottom runs at half the speed (PCIe 2.0 spec) and doesn't support SATA-connected drives. 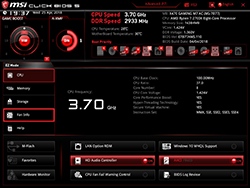 This is a chipset limitation rather than MSI being stingy. The two primary x16 PCIe slots are connected to the CPU and offer the choice of either single x16 or dual x8 in CrossFire or SLI configurations. 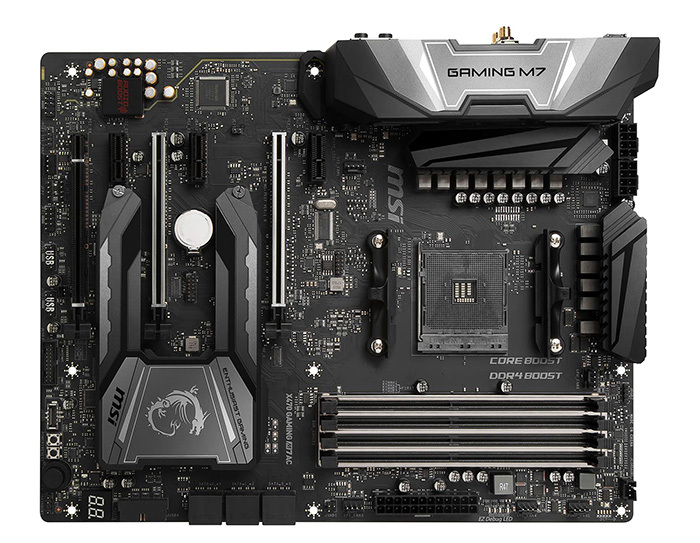 You can't release a premium motherboard without having strengthened slots, so they are very much in evidence here, too. Rotated SATA ports enable a clean build, and overall layout is good enough not to cause any obvious problems with a single high-end card in position. Notice that big button, known as Game Boost Knob? It's designed for easy-as-pie overclocking if you can't be bothered with the BIOS, and it works by turning the knob to the left. 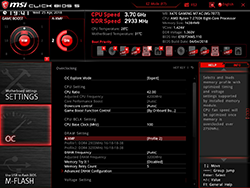 You hear a click as it goes into one of 11 positions, and each offers the next level up of all-core overclocking. MSI publishes a list of speeds on first-generation Ryzen CPUs. The frequencies are different on a Ryzen 7 2700X, with 'stage 2' offering 4.15GHz and 'stage 10' an improbable 4.35GHz. Note that you have to adjust CPU voltage manually. 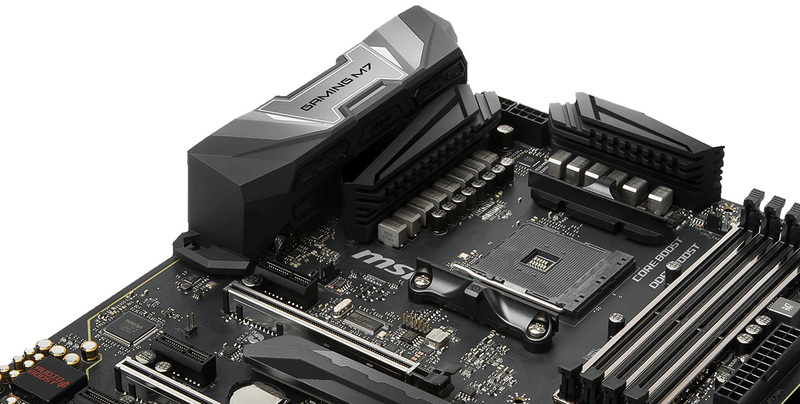 We prefer the all-in-one I/O shield on the latest Asus and Aorus boards. 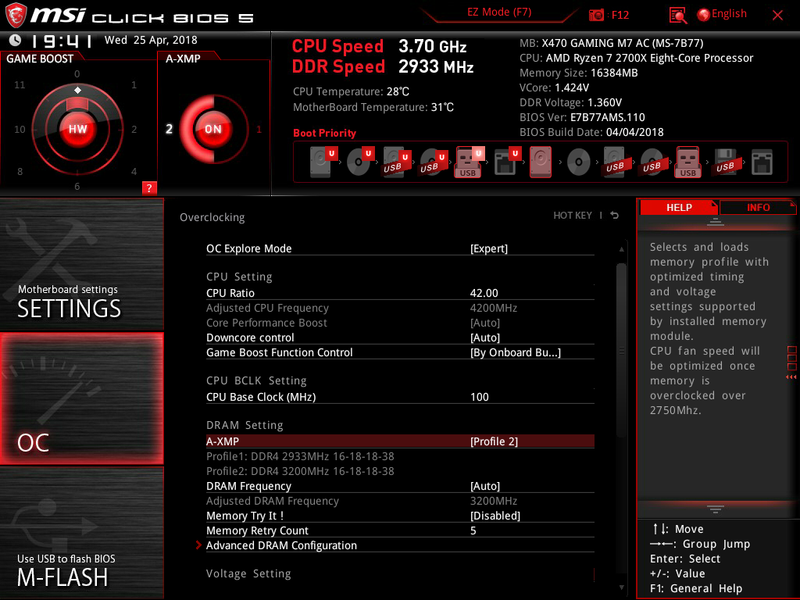 MSI's is similar to most, however, with handy clear CMOS and BIOS flashback buttons. Though it matches the Aorus on the audio front, using an older-generation Intel Wifi/Bluetooth M.2 module means that maximum theoretical wireless speed is 867Mbps compared with 1,733Mbps on the competing board. MSI bundles in the relevant antennas in the box, of course. Killer provides the Gigabit LAN. Directly beneath is the USB 3.1 Gen 2 support, which is typical in that it has both Type-C and Type-A ports. The remaining red ports are USB Gen 3 Gen 1 while USB 2.0 feels archaic. Firmware, meanwhile, remains the Click BIOS 5. An easy-to-use GUI meets you on arrival, but any enthusiast will automatically press F7 and run into the advanced section. The firmware is smooth and relatively simple to navigate, with enough voltage and adjustments, but feels somewhat less intuitive than, say, the latest Asus BIOSes. One could argue that it is need of an overhaul because the BIOS is largely the same as the Z97. What we do like is that MSI doesn't mess around with the boost speeds mandated by AMD; there's no auto-overclocking in evidence, unless you increase speeds via the aforementioned knob. A couple of good features include the ability to secure-erase an SSD from the BIOS and a summary of any changes made under a log that can also be seen when exiting. The four-point clickable fan curve is another good point, and adjustments via PWM or DC enable you to really quieten the system down, which is exactly down our street.